A sunny day like a jewel in a dull, cold winter. For the first time in months I venture out to do some gardening. There are little signs of bug activity. 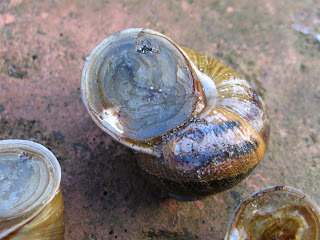 A few 7-spot ladybirds sunbathing; a cloud of winter gnats; a bluebottle which rapidly gets into the house through the back door...I moved an old tile left leaning against a south-facing wall and found a gathering of overwintering snails stuck to the tile and the wall. A few small ones, but mostly of them grown up snails, shell against shell. In this spot they keep relatively warm and dry during the winter. The snail secretes a specially tough mucus to seal its shell opening which can glue it to walls, or other snails. 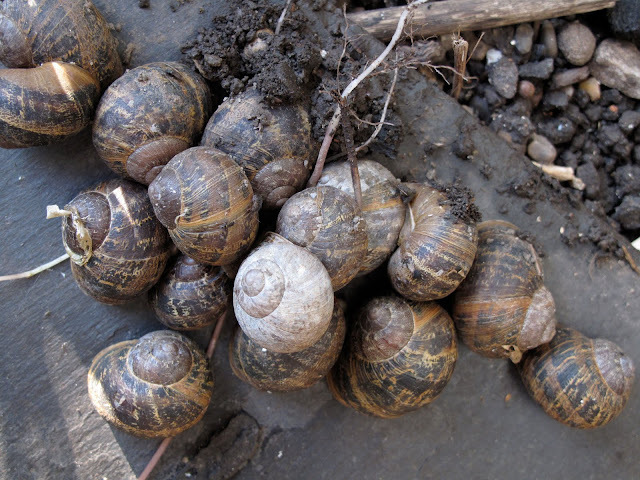 Darts for love on the strange mating tactics of your garden Snails. Hi there just found your great blog. I wonder if you would allow me to use a photo and quote some text from your excellent wool carder bee post with links etc. I am in the middle of doing a painting of the wool carder bee and write a bit on my blog about the bees as I go. Have just put up post about the Ivy bee with photos with some text and photo from Jane at Urban Extention.. you can see how I do things there.. how is Hull?? I am a Yorks/Lincs girl exiled in the USA temporarily. Love the snails, not many here. It's surprising what you miss when away from home! Thank you for visiting my blog and for your nice comments sharp green pencil. You are most welcome to use my photo. I love your Colleted drawing by the way. I look forward to see your Wool Carder Bee drawing! It's been a long cold winter and I can wait for the bugs to stir! Thanks very much, also see you quoted the G White piece about them which I'm including in the post too. He was such a lovely writer.Found a super site dedicated to him.. Thanks again your posts are a real help! blog post done .. thankyou for your super posts! Great to be able to send people your way. Thank you Suz for your nice words. Winter is being quite long this year, but BugBlog is due to awake soon from its long snooze and report on the wonderful life of bugs!